If you are a new stock market investor and willing to invest in stock market, you need good trading demat account for buying and selling stocks. A Large number of trading demat account options are available in the market and you must be wondering where to open trading demat account? In this post, I will discuss Best Online Trading Demat account options in India. I will also compare cost associated with each account option. ICICI Direct offers 3-in-1 online account for saving, trading and demat requirement. ICICI Direct demat account also provide facility to invest in 20 different financial products including equity, derivative, mutual funds, ETF, fixed deposit and NPS. SBI offers online demat account facility for both Indian Residents and NRI’s. This account is known as eZ -Trade account. You can invest in equity, mutual funds and derivatives using this online account. HDFC Online Trading account is offered by HDFC Securities. This account provides options for trading on both NSE and BSE. You can do delivery based, intraday and future option trading using this account. Axis Direct offers 3-in-1 online investment account. You can invest in equity, mutual funds, IPO, NCD, ETF, Company FDs using this account. Kotak Securities is one of the largest brokerage in India. Kotak Securities offers 3-in-1 trading account. This trading account offers online trading facility in equity, derivatives, IPO, ETF and bonds. Best online trading demat account given above are selected based on extensive research and data available over the internet. Evaluation criteria for the selection of best online trading demat account is given below. You should consider account opening fees and AMC charges while opening demat account. Account opening fees and Demat account AMC for all brokerage houses varies from Rs. 500 to Rs.999. Look at fee comparison table given below. Another important factor you should consider before opening demat trading account is brokerage charges. Brokerage charge comparison of Best online trading demat account is given below. Third factor for the evaluation is usability. 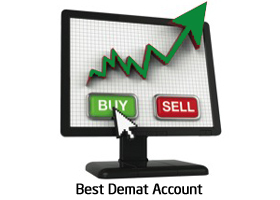 Trading Demat account should be user-friendly and easy to operate. Customer service is most important factor in evaluating demat account. Customer support should be excellent and accessible all time. You should carry out an independent research before opening online trading demat account. I am using Funds INDIA. Account opening charge is Rs.500 which will be adjusted with brokerage on first year. And annual fee of Rs. 200 after that. Not yet used intraday, but less than others. I am using ICICI Direct Trading demat account since past two years and I am satisfied with ICICI Direct.